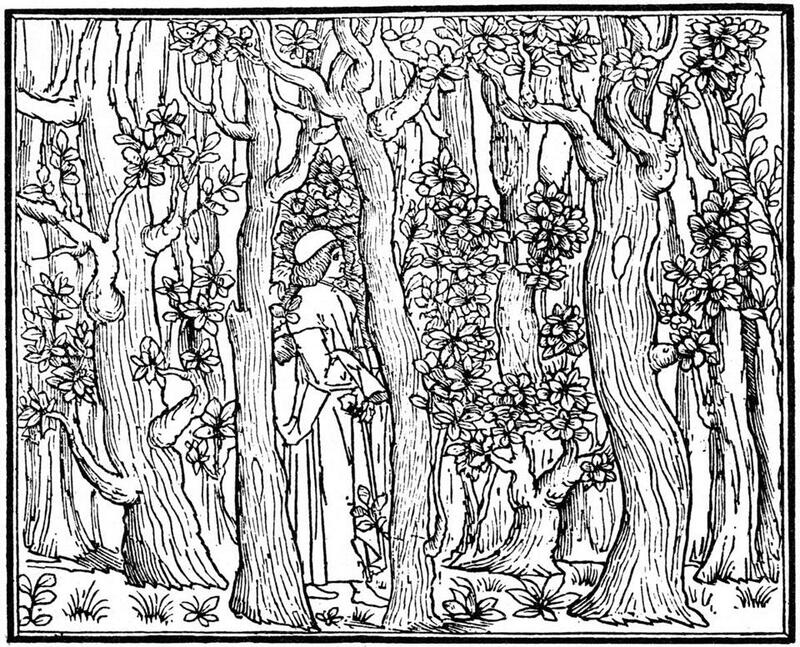 “The Lover in the Wood,” engraving from 1499. In recent years, “sustainability” has become an inescapable buzzword. Companies launch sustainability initiatives; virtually every major American university now has an office of sustainability; and the word is a staple of United Nations commissions and conferences. Like “diversity” and “social justice,” sustainability is easy to embrace and, not coincidentally, hard to define: It nods to a belief in the wise use of resources while remaining vague about what that actually entails. The term can refer to an initiative as limited as, say, stocking a school’s printers with recycled paper. At the other extreme, it can encompass a nearly utopian vision that extends well beyond the environment. It may be impossible to trace such a diffuse and protean concept back to any single origin. But Caradonna, an associate professor of history at the University of Alberta, finds some of the first antecedents of our modern notions of sustainability in late 17th- and early 18th-century Europe. Among his surprising discoveries is that many of sustainability’s forefathers were far from radical tree-huggers. They were, rather, aristocrats and colonialists—people hoping to profit from the land—who began to fear that the heedless plundering of natural resources could jeopardize the economy. The philosophy has since evolved in various directions; some now believe that social equity is a key part of a sustainable society. What the different offshoots share is respect for the planet’s limits—though debate will no doubt continue on the best ways to implement that principle. Caradonna talked to Ideas recently from Alberta. IDEAS: When and where did the concept of sustainability arise? CARADONNA: If you have a sustainability movement, you know you have a problem. The highlanders of New Guinea, who lived sustainably for 46,000 years, didn’t need a sustainability movement because they were just an inherently sustainable society. They had figured things out a long time ago. So the fact that people in Germany and France and England are talking about sustainability is a clue that something was going wrong. And the thing that was going wrong was that the society had been badly deforested. Forests were hugely, immeasurably important for pre-industrial societies, not only for Europeans but for people all over the world. It was the primary source of energy....That’s how you cook your meals. That’s how you heat your home. That’s how you produce iron and iron forges through charcoal production, and so on. So these guys are writing about the ramifications of woodland loss, and are arguing that society won’t necessarily collapse, but society as we know it will not continue to exist, and industry in particular will collapse if forests disappear. And therefore they’re arguing for what was later called sustained yield forestry. The guy who invents the term sustainability—Nachhaltigkeit in German—Hans Carl von Carlowitz, in 1713, is talking about the need to have a continuous supply of wood so that forges and mines can continue to function in Saxony. IDEAS: And coal was actually seen as a solution to the problem? CARADONNA: Yes. And in fact, it was the solution for a while....There was something like 25 million hectares of woodland that was lost between 1700 and 1850, and that rate of loss slows down in the mid-19th century, as coal begins to be mined much more readily. It did take the pressure off of forests, but of course as we know, coal creates a whole new set of problems. IDEAS: How do you distinguish between the sustainability movement and the environmentalist movement? CARADONNA: I think it might be a little unfair, but from my point of view the difference between sustainability and environmentalism is that sustainability is about having a vision for the future. And environmentalism is about dealing with problems that have led us up to the present day. It’s about the past and the present. And I think sustainability says, OK. We screwed it all up. We know that emissions are a big problem, we know that water pollution is a problem....Now what? IDEAS: You found that the political origins of the philosophy were surprisingly diverse. CARADONNA: Beginning with the right, we could talk about Malthus, who was a conservative preacher and early demographer who was concerned that humans would outstrip their natural resources and their ability to live within their limits. So his warning about the potential downfalls of overpopulation has been hugely impactful for people in the sustainability world. And he’s fundamentally a conservative....And then there’s inspiration also being taken from the left. Let’s say a Friedrich Engels, who’s one of the first people to recognize the relationship between social inequality and environmental degradation in his study of the English working classes in the 1840s. IDEAS: Were there other times and places where serious environmental problems arose without this response of thinking about sustainability? CARADONNA: Yeah! All of those societies that collapsed. I mean, if you talk about Easter Island, or the Maya, or the Vikings in Greenland, or the Anasazi, a lot of these people that struggled, they outstripped their natural resources. You know, there is this tendency to romanticize pre-industrial and especially aboriginal societies, but some of them were spectacularly unsuccessful. IDEAS: Was this a radical development? CARADONNA: I would not say that the sustainability movement and its origins were radical. I would say in many ways they’re critical. They’re critical of deforestation, later on they’re critical of unchecked economic growth and deregulation, and they’re critical of pollution and social inequality. But in many ways, it’s quite conventional. I mean, one of the things I’ve noticed is that some of the early advocates for what we could call sustainable living were aristocratic bureaucrats, or imperialistic bureaucrats who are stationed on islands in the West Indies or the East Indies. Or someone like Hans Carl von Carlowitz, who’s part of the Saxon Dynasty, he’s part of the monarchy there. None of these people, as far as I can tell, are interested in the natural world, in and of itself. None of them. They’re interested in natural resources because they have an impact on the economy and they have an impact on the human realm, in one way or another....Perhaps counterintuitively, the sustainability movement has roots in good old-fashioned economic and monarchical self-interest. IDEAS: The concept of sustainability leaves a lot of room for interpretation. Do you think that’s a blessing or a curse? CARADONNA: It facilitates greenwashing for sure, because it’s a term that can be used and abused....What I think is fascinating is that it’s a really flexible discourse and allows for a lot of people to get into the tent together. And I think from a kind of political science-y point of view, it is useful and helpful to get everyone in the tent together. Rebecca Tuhus-Dubrow is a columnist for Next City, an urban affairs website. • Q&A: Were Aristotle and Thoreau ecologists?